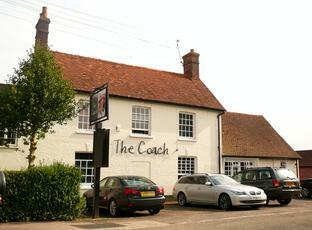 Great pub with delicious food. Menu is heavily biased to American style BBQ food with huge Man v Food portions (they provide takeaway boxes for leftovers). The menu has burgers, hotdogs, smoked meats and there is a specials board. The smoked brisket was tasty and there were enough chips to choke a horse. Good selection of beers, has a pool table, beer garden and smoking area. The pub and garden can be hired for BBQs. Staff are friendly and efficient. Now re-opened as of yesterday, 17th October 2012. To an untrained eye seems to be very similar to the place as it was before. Currently 3 real ales including the local West Berks Good Old Boy. Newperties Ltd are the owners of the freehold of the Coach and the Coach became vacant following the acceptance by Newperties of an early surrender of the Lease from the previous tenants which was disappointing as Newperties Ltd had carried out substantial refurbishment work at the tenants request prior to the commencement of the tenancy in 2009. Their tenancy had been unsatisfactory. As a result Newperties Ltd have had to undertake works which the former tenants failed to do firstly to meet Fire Officer requirements and secondly as former tenants maintenance of particularly the drainage system the kitchen equipment and carpeting had been poor work is being undertaken to return those to prestine condition. On completion of these works it is expected that a new husband and wife team experienced in this business will reopen in or about this Easter with a fully qualified experienced chief and supporting staff. Rating of this family business is considered (hopefully) by the local community and afar will be high. Now closed. Building works ongoing apparently uprating fire protection. Builder made interesting comments about the state of the kitchen and of the place/accomodation in general, and of the departure of the previous tenants. Allegely scheduled to re-open with new tenants around Easter time.